I’m not a huge fan of fish but know my body needs the healthy fats and protein that it contains. So, I’m always looking for a fun flavorful salmon recipe. And I’m always glad when I can make my whole meal in one pan for easier clean up. I used a 10” cast iron skillet for this recipe, but next time would use my 12” for a thinner layer of cauliflower rice. 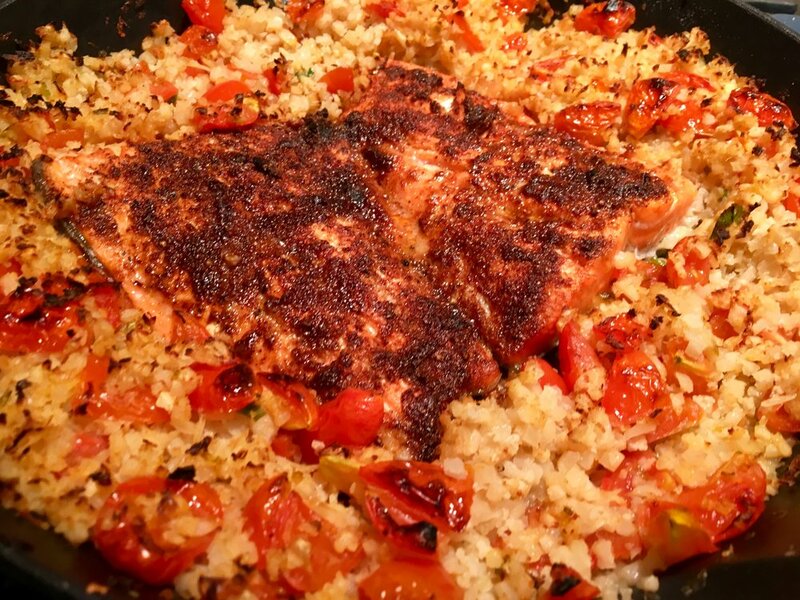 Enjoy this Cajun Salmon with Tomato Cauliflower Rice! Gluten, grain, soy, and dairy free. Preheat oven broiler to 500 degrees. Add lime juice and 1 tbs oil to shallow dish and place salmon filets skin side up in the marinade. Allow to sit while preparing the other ingredients. Combine the ingredients for the spice rub in a small bowl and set aside. Heat 2 tbs oil over medium-high heat in an oven safe skillet. Add onion and garlic and saute for 2 minutes. Add cauliflower rice and cook until completely thawed. Add paprika, cumin, salt and tomatoes to the dish and stir to combine well. Move the cauliflower rice mixture to the sides of the pan. Drizzle the remaining 1 tbs oil in the center. Remove salmon from the marinade and place skin side down in skillet. Rub the spices over the top of the salmon. Move skillet the oven and broil 5-7 minutes until salmon is flaky and cooked through. Serve salmon immediately over cauliflower rice.